Music for Weddings, Functions, and Corporate Events. entertainment is the main aim: my/our function is to add to the atmosphere, but not primarily to educate people. There's often still interaction: people at theme weddings still often come up & ask about the instruments - that's fine! Please see Interpretation for events where education/interaction/getting people involved are the main aims. or duo with my wife Elizabeth York. 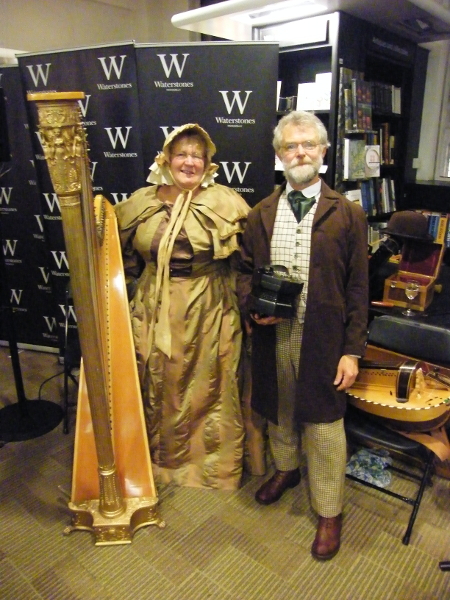 October 2014: Musicians for the high-profile book launch of Anthony Horowitz's "Moriarty" at Waterstone's Piccadilly branch. "any number of people have thanked [us] for a wonderful evening and its success is in no small measure down to your contribution". Following an event at Coventry's medieval guildhall,for the Guild of the Freemen of the City of London, from letter of thanks, quoted by permission. theme weddings, - medieval, Tudor, 17th Century, Victorian, etc. theme events - Medieval feasts etc. 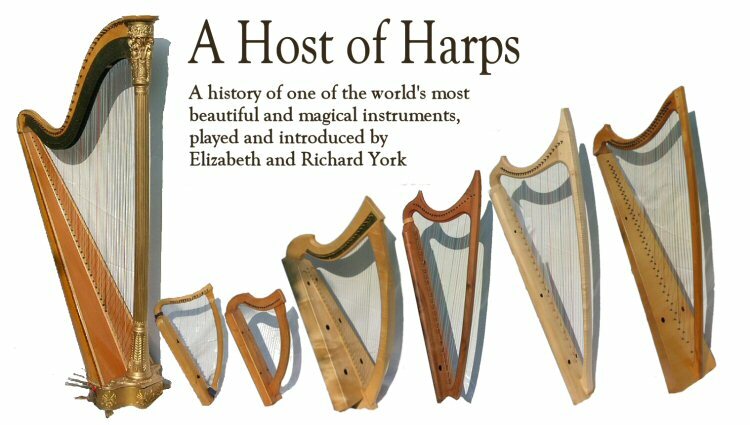 Please also see Elizabeth York's own website for more details of harps for weddings, funerals, and other functions. melodeon, piano accordian, anglo & english concertinas, hammer dulcimer, whistle/low whistle, hurdy gurdy, Northumbrian smallpipes, bodhran. A willingness to fit in with the aims of your event... where reasonable! "You will be pleased to know that your performances at the wedding were a topic of conversation with many guests. Feedback was 100% positive and you were enjoyed by all." Who's employed me/us, or where? Why have Solo or Duo? the duo is able to offer more variety of musical sounds and arrangements. she also adds her singing voice, which is far better than mine! 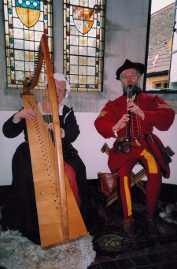 Meet and hear harps from replicas of tiny medieval instruments, via the rich and surprising sound of the bray harp, through to a restored period original of 1833, each playing music of their own period and style, to show the astonishingly varied history of this instrument. 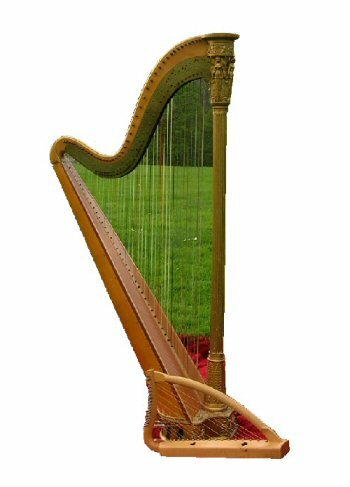 Learn what the father of Galileo had to do with harp design, what the near-magical requirements for the ancient celtic harper were, what a top French concert harpist stole from his audience, and much more. The programme is leavened by other instruments playing along with harps, from recorder to shawm, hurdy gurdy, bagpipes, and more. Ideal for a pre-booked audience; there's also the possibility of a workshop session to link in.